(MoneyWatch) Senate Banking Committee members gave a polite reception to Mary Jo White Tuesday in a hearing to consider the former federal prosecutor as the new head of the U.S. Securities and Exchange Commission. A former U.S. attorney under Rudy Giuliani who has spent the last 10 years at a Wall Street law firm defending some of the nation's top bankers and other corporate executives, White gave predictable reassurances that her tenure will be marked by tough enforcement and swift implementation of financial reform laws. Although White is likely to be confirmed as the nation's top securities regulator, many observers had expected harder questioning over her trip through the revolving door. As a partner at white-shoe law firm Debovoise & Plimpton, she defended some of the country's biggest, and by some measures notorious, bankers, such as Kenneth Lewis of Bank of America (BAC). Other clients included bailout recipients JPMorgan Chase (JPM) and General Electric (GE). Assuming White is confirmed, her previous private-sector legal work means she may be forced to recuse herself from matters involving some of the country's largest financial institutions. But the questioning on that matter and others was muted, especially compared to the bruising hearings faced by recently confirmed Defense Secretary Chuck Hagel and CIA director John Brennan. Sen. Sherrod Brown, D-Ohio, one of the tougher interrogators Tuesday, said there is "concern" about White's passage from private litigation on behalf of corporate clients to government watchdog. But he, too, appeared to struggle with the question of what critics argue is a clear conflict of interest. "Nobody questions your integrity or your toughness," Brown said. "But we need some reassurance that when you have this job, the culture you have come out of the last 10 years, both socially and professionally, will allow you... [to do the job] or perhaps make you better at it." "What have you done the last decade to advocate for ordinary investors?," he concluded. 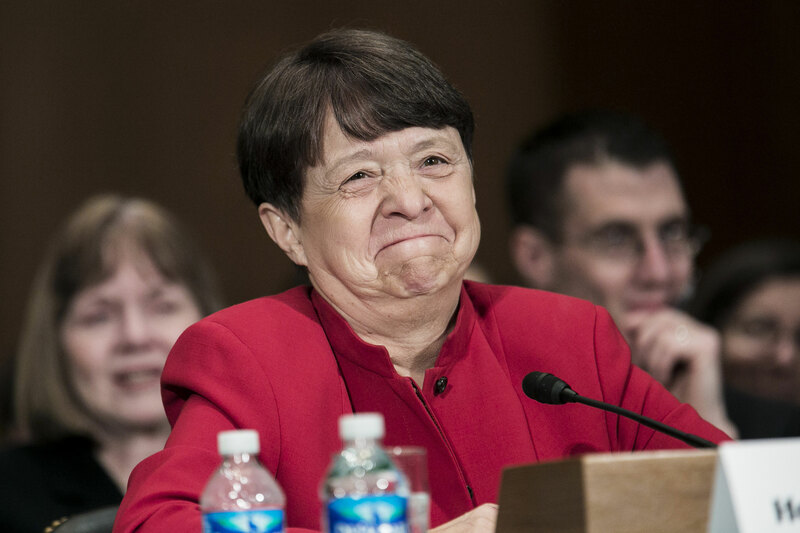 White offered no examples from her career representing bankers, but suggested that ordinary investors rely on her performance as a federal prosecutor. "I've been a lawyer over the last 10 years and I've represented different kinds of clients, and when you're a lawyer you're ethically bound to represent them to the best of your ability," she said. "That doesn't mean I embrace the policy thoughts of any of my clients. The public investor should know that I am their advocate." In her prepared remarks, White pledged to move expeditiously to finish the rulemaking mandated under the 2010 Dodd-Frank financial reform law and the so-called JOBS act, which aimed to help small businesses raise capital. She said the SEC would take into account economic analysis of the impact of the rules the commission writes. White also pledged to step up enforcement and go after wrongdoers "of whatever position or size." But when Brown and others on the Senate panel asked her about the SEC's oversight of Wall Street banks widely acknowledged to be "too big to fail," White said the commission should weigh the economic fallout of any prosecutions of the companies. (The SEC has no criminal prosecutorial power of its own but instead makes referrals to the Department of Justice.) "It's again a factor that prosecutors are directed to look at," White said of shareholders and workers who might suffer were a big bank to be prosecuted. "We want our prosecutors making decisions in the public interest. But obviously you don't want to have a two-tiered standard." In response to White's pledge to weigh the economic effect of regulations before writing rules, Sen. Elizabeth Warren, D-Mass., asked the nominee to consider the impact of not writing financial reform rules. Indeed, it's looking more and more like not writing those rules is the new normal. By many estimates, nearly two-thirds of the regulations to implement Dodd-Frank have yet to be written, including the so-called Volcker Rule banning proprietary trading by banks. Until the rules are written, financial reform is effectively dead in the water. So the issue of White recusing herself from either enforcement decisions or rulemaking takes on a huge significance, especially since the five-member commission is, without the chief, evenly divided between Democratic and Republican commissioners. White's absence could leave it paralyzed. "It is unclear what she will recuse herself from in a rulemaking context," said Bill Black, a former banking regulator and prosecutor who now teaches law and economics at the University of Missouri, Kansas City. "We don't even know at this point what she has participated in so far as counsel to the people who are trying to gut the rules. She works for a whole list of people who are trying to stymie financial reform. The real problem is what she doesn't recuse herself from." As for the revolving door not making a difference, or even making White a more knowledgeable advocate on behalf of the public, Black, who in the 1980s helped expose corruption in the savings and loan scandal, called such notions naive. "This doesn't work as a practical or a human matter," he said of the idea that a lawyer who has been representing rich and powerful people will turn around and prosecute them upon taking office. "It's not how people operate. It's a fiction, and she's a terrible choice."